“Totes for Kids” project is a FOL mission established to follow Christ’s example of helping kids who are in need. The FOL “Totes for Kids” project provides weekend totes for children selected by schools near FOL. These kids receive free breakfasts and lunches at school during the week, and a weekend tote is prepared by FOL volunteers and delivered to the schools. Special food totes are prepared for holiday weekends and provide additional food for the days off. Another event gives kids backpacks filled with school supplies to prepare them for the beginning of the school year. This FOL mission project comes under Haven Totes, Inc.
“Tote Tree Gifts” at Christmas is another mission that falls under the FOL Haven Totes program. It is another example of helping kids who are in need. 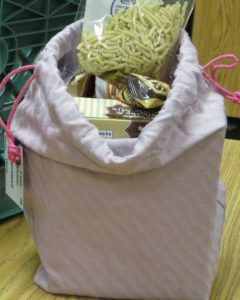 Every child on our “Tote for Kids” project will receive a clothing item for Christmas from a member of our congregation. It is a way that our congregation shares Christ’s love with others. Senior Totes is a project designed to reach out to low-income seniors living in nearby care homes and to provide them with a “tote” of monthly personal hygiene supplies and snacks. It is typical for these seniors to have $50 or less to spend on items needed for their personal care. The Totes our FOL volunteers provide is an encouragement and assists with needs that exist. Totes are delivered, along with a friendly visit, which lets the seniors know that someone cares and is reaching out to them. It is amazing to see how often the Senior Totes volunteers are as blessed by God’s love and mercy during these visits as the seniors are!